No matter where or when the IFTA decal is obtained, all decals will expire on December 31st every year. 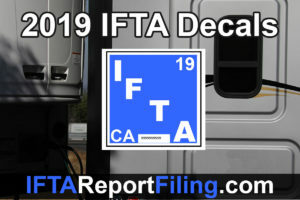 The staff at IFTA Report Filing recommends owner opertators and trucking companies to renew the IFTA decals immediately after expiration, but you are not required. There is a 2 month grace period from December to February until the next fuel tax. Please consult with the staff at IFTA Report Filing to make sure you are legal and in compliance on the road. Following are some facts about IFTA Decals. Kleen StripVM&P naphtha, mineral spirits, turpentine or other solvents commonly used on vehicle finishes. compared to a new clean decal. WE HAVE AN IFTA ACCOUNT NUMBER: GA 16170193701 AND NEED RENEWAL AND STICKERS FOR 2 TRUCKS IN OUR FLEET, AS WELL AS 1 ADDITIONAL TRUCK THAT WE ARE AWAITING OUR TITLE IN ORDER TO REGISTER IT THROUGH THE IRP. PLEASE CONTACT ME SO THAT I CAN GIVE YOU MY CREDIT CARD INFO IN ORDER TO PAY FOR THE STICKERS FOR OUR 2 TRUCKS ALREADY REGISTERED WITH IRP AND HOLD STICKERS THAT EXPIRED IN DECEMBER OF 2018. WILL THEN REQUEST STICKERS FOR THE NEWLY ADDED TRUCK WHEN WE RECEIVE THE NTITLE IN OUR NAME. THANKS, IN ADVANCE. YOUR SYSTEM SAYS THAT MY COMMENT IS AWAITING MODERATION. WHAT DOES THAT MEAN?